As visible on the picture below the Top Secret Room is just a cavern build up from 1 screen filled up with 45 Blue Rupees worth in total 225 rupees. Its exit leads to the overworld (you get out of Link's House) and therefore this room is considered by some as a debug room or such, because normally it is not possible to enter it. There is a usuable method that will let you end up in the room, but there is not much information about it, though. 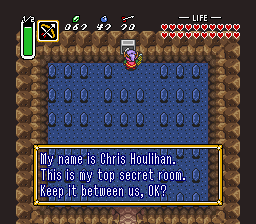 The difference with the original Top Secret Room is that the telepathic tile is removed and the game no longer mentions the name: "Chris Houlihan". Also this room can no longer be entered via conventional methods that were used in the SNES verion of the game. The only way people managed to get here is by using some hacking tools or by using an emulator. In the beginning of the 90s before ALttP was released for the American audience NP held a contest. The winner of the contest would get to have his/her name engraved in the top secret room. It turns out that Chris Houlihan was a subsriber of Nintendo Power (a Nintendo magazine) and he was the winner of that contest. He got his name in the game, but since this room is so secret only very few people have ever been able to see it. My name is Chris Houlihan. This is my top secret room. Keep it between us, OK? This page was last modified on 13 January 2006, at 13:12.